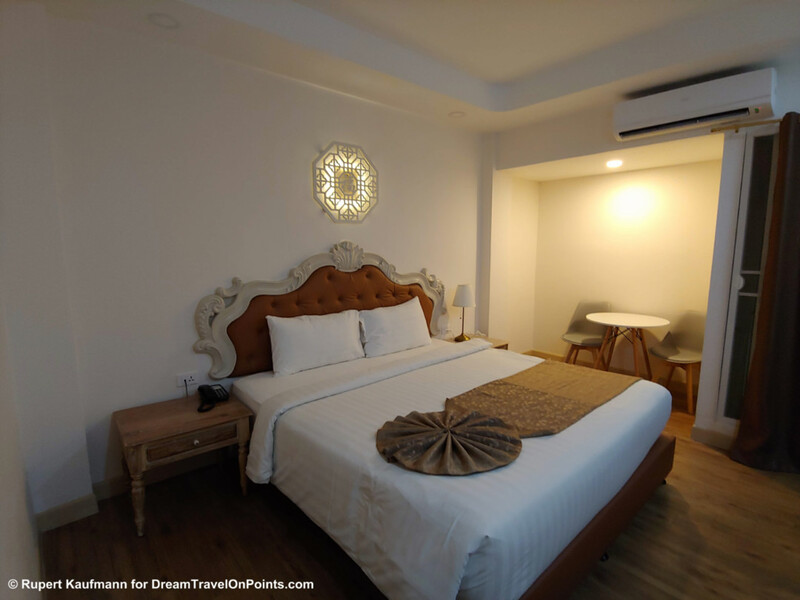 The Hi Chiang Rai Hotel offers clean and modern rooms in the center of Chiang Rai in Thailand’s North, making it easy to explore the town and surrounding sights. Service is friendly, but an odd pool and limited breakfast are downsides. Check out my review and photos to see, if this is the right hotel for your visit to Chiang Rai! Location: The Hi Chiang Rai is located on the main road in the heart of Chiang Rai. There are plenty of restaurants and stores nearby, as well as the bustling night market. The Hi Chiang Rai Hotel is a 20 minute ride from the airport or a 5 minute walk from the bus terminal. It’s easy to catch a taxi or hail a grab ride in town to see the local attractions. 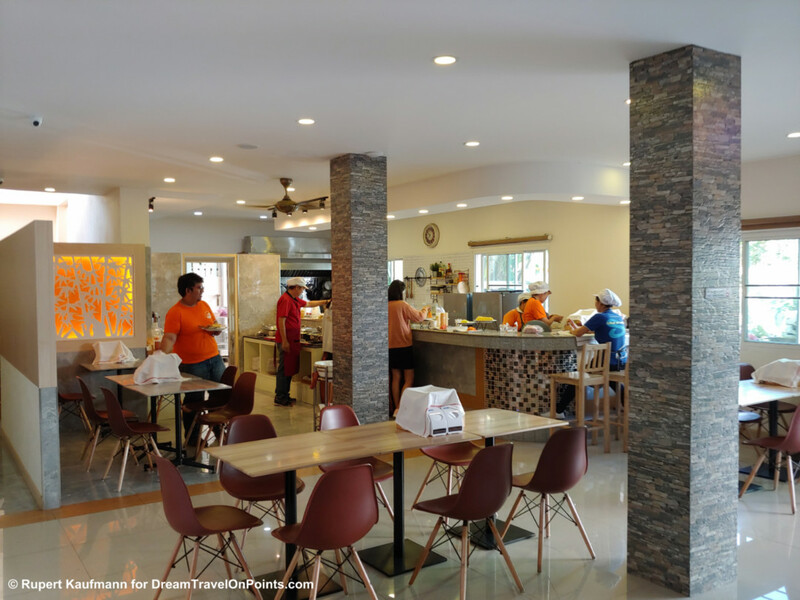 The location is convenient to explore Chiang Mai and the surrounding area. The hotel is set back from the road and I didn’t have any noise issues. Service: The front desk staff at the Hi Chiang Rai Hotel was very friendly. My check-in just took a few minutes and the staff explained the amenities of the hotel. Check-out required staff to check the room (like in most hotels in Thailand) and took a little longer. Staff spoke English well enough. Housekeeping did a thorough job each day, cleaning the room and replacing towels and toiletries appropriately. Everything was in working order throughout my stay. Restaurant staff didn’t speak much English, causing some issues: My rate included breakfast, but staff insisted that it didn’t – probably caused by not understanding the room number. It took the front desk staff to sort it out. Best to bring the little card with your room number on it to avoid any issued. They did keep the breakfast buffet stocked and tables clear. Room: I had booked a standard room and that’s what I got. The Hi Chiang Rai is a new hotel and rooms look like it. They are held in a traditional decor. Floor are wood-look, walls are whie and the furniture is a rustic-looking wood. The king-size bed has a padded headboard and good sheets and pillows – I slept comfortably. Against the wall is a small seating area with two chairs and a table. Facing the bed are a desk with chair to get some work done. There are two benches for your luggage. The wall-mounted TV is pretty small and offers mostly local channels. 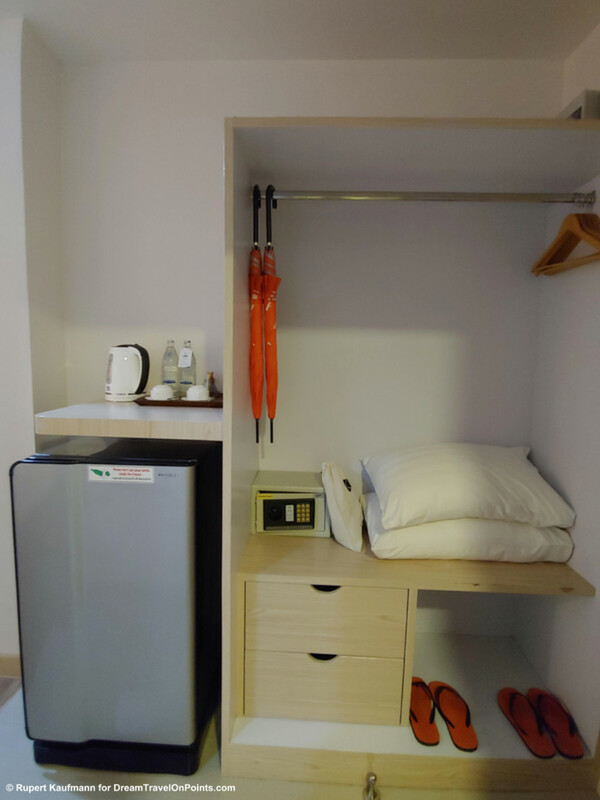 Next to the entrance is an open wardrobe – you’ll find a large fridge, coffee/tea facilities, a small safe, umbrellas, slippers and some extra pillows. The bathroom is just as new, clean and in good working order. The sink is built into the countertop and there is plenty of space for your toiletries. The shower is glass-enclosed. 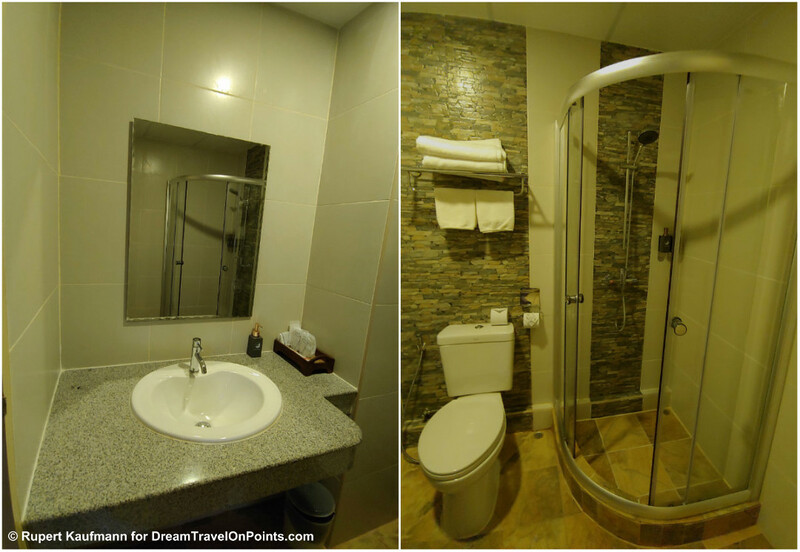 The bathroom is held in beige/brown tones and there are some nice accent tiles behind the toilet and shower. Soap and shampoo are provided in dispensers and towels are of good quality. 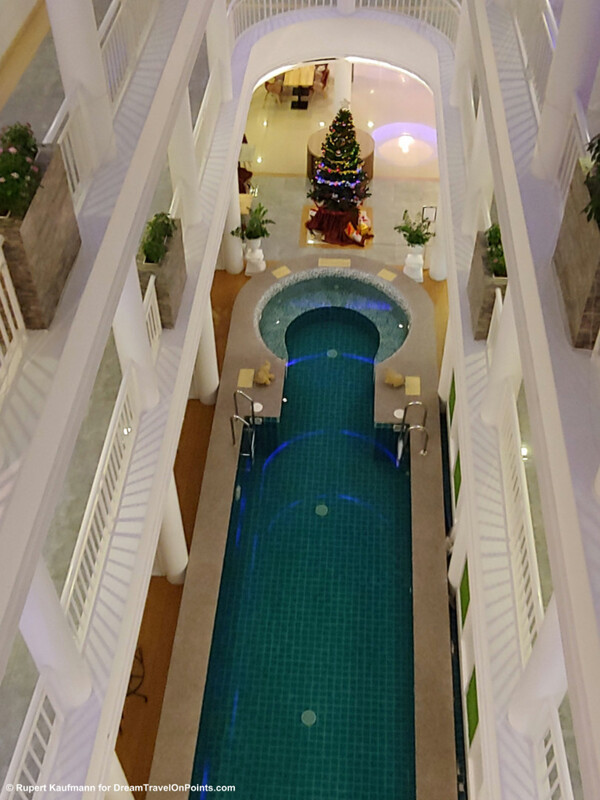 Restaurant & Amenities: The Hi Chiang Rai has a pool that’s located in the lobby atrium, surrounded by rooms. It’s long enough to swim laps and there is a jacuzzi at one end. It’s not heated, so I didn’t last long in the jacuzzi. It’s also a little weird to sit in the lobby, with guests coming and leaving or sitting in the restaurant right next to you… there is no fitness room. You can borrow a bicycle for free to tour the city. I tried them out for a trip to the river, they are multi-gear mountain bikes and they work reasonably well. The restaurant offers a buffet breakfast. There is limited cafeteria-style seating in the lobby. The selection is limited, with bread, fruit and some hot dishes available, as well as coffee and tea. I’d consider both the quality and selection below average for the price category. Value & Rewards: I paid $62/night for a standard room including breakfast at the Hi Chiang Rai during high season. The central location and modern room are balanced by a poor breakfast and mediocre amenities, so the value is just ok. I’d consider staying in one of the nicer hotels by the river for just a little more money. The Hi Chiang Rai doesn’t offer any rewards program. I booked through hotels.com, earning 10% in WelcomeRewards towards a free night! Bottomline: The Hi Chiang Rai is the most modern hotel in downtown Chiang Rai, offering new, clean rooms. 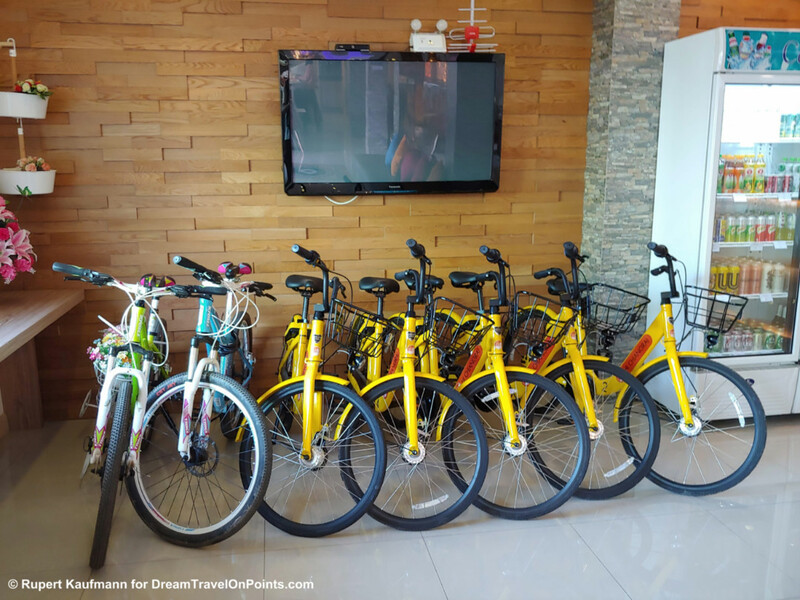 It’s convenient to explore the town and surrounding sights and the bicycles are helpful. The odd pool looks better in online pictures and the breakfast could use some improvements. It’s good enough for an uneventful stay. For a weekend getaway, I’d consider one of the slightly more expensive and more upscale hotels by the river for a better experience. You can find current rates at the Hi Chiang Rai here!